The Schecter Stiletto Session-4 Bass Guitar has a resonant swamp ash body that offers a sweet, airy tone with pleasing highs and firm lows. The Schecter’s full maple neck and fingerboard delivers bright characteristics, with a snappy attack in the midrange. A set of EMG pickups provide sensationally punchy lows and sharp, crisp highs, making the Stiletto Session able to hold its own in any genre of music. 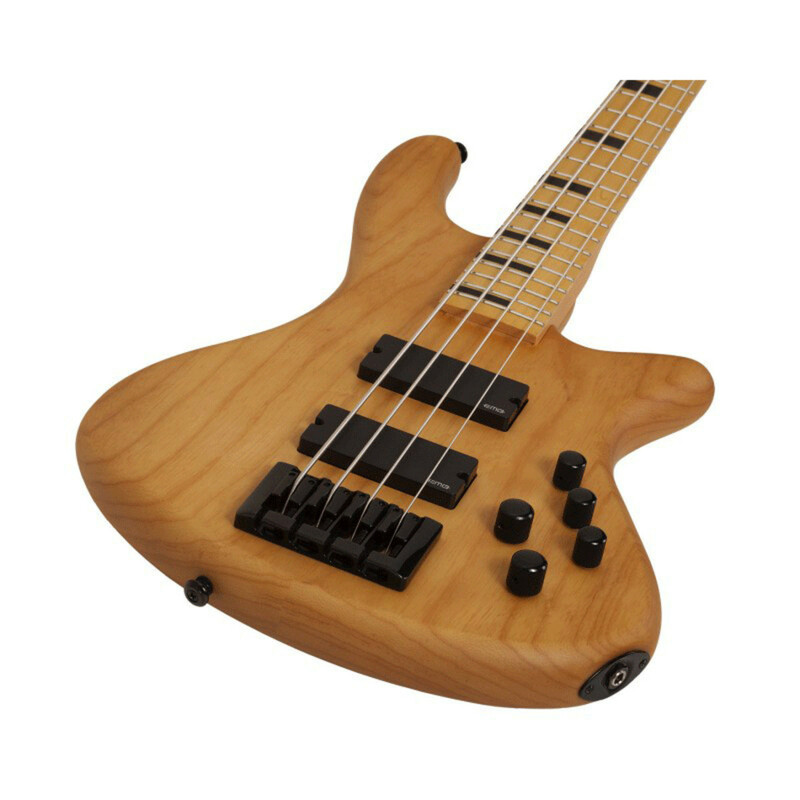 Also featuring Grover tuners, a Schecter custom bass bridge, a 3-band EQ, and a Graph tech nut, the Stiletto bass is given an aged natural finish that shows off the natural grain the guitar woods. 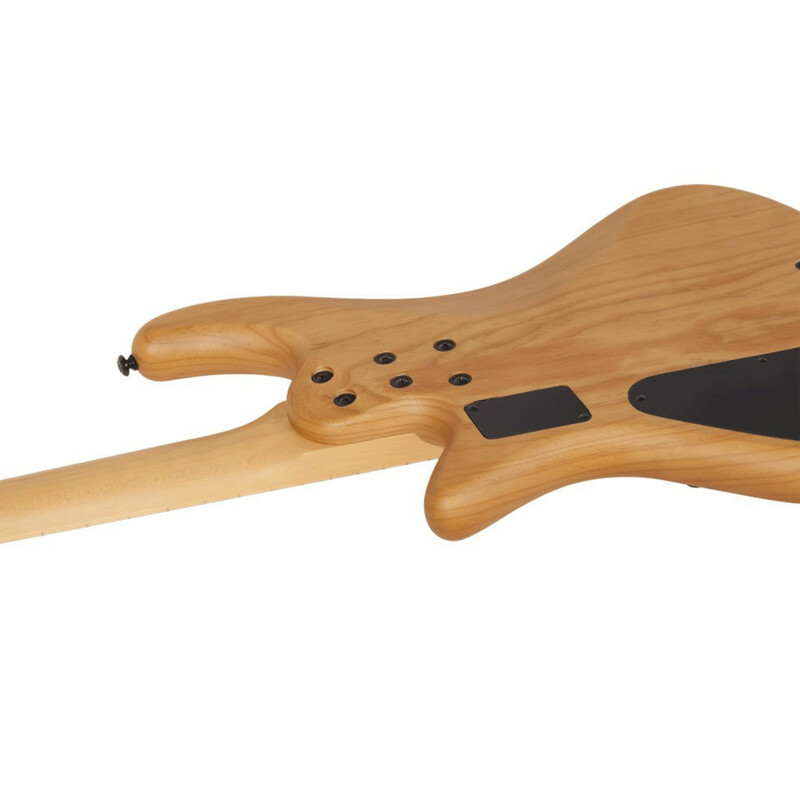 The Schecter Stiletto Session has a body constructed from high quality swamp ash, making it lightweight, and resonant. The swamp ash creates an airy, twang tone that’s pleasantly sweet, offering firm lows, pleasing highs, slightly scooped mids, and an excellent amount of sustain. 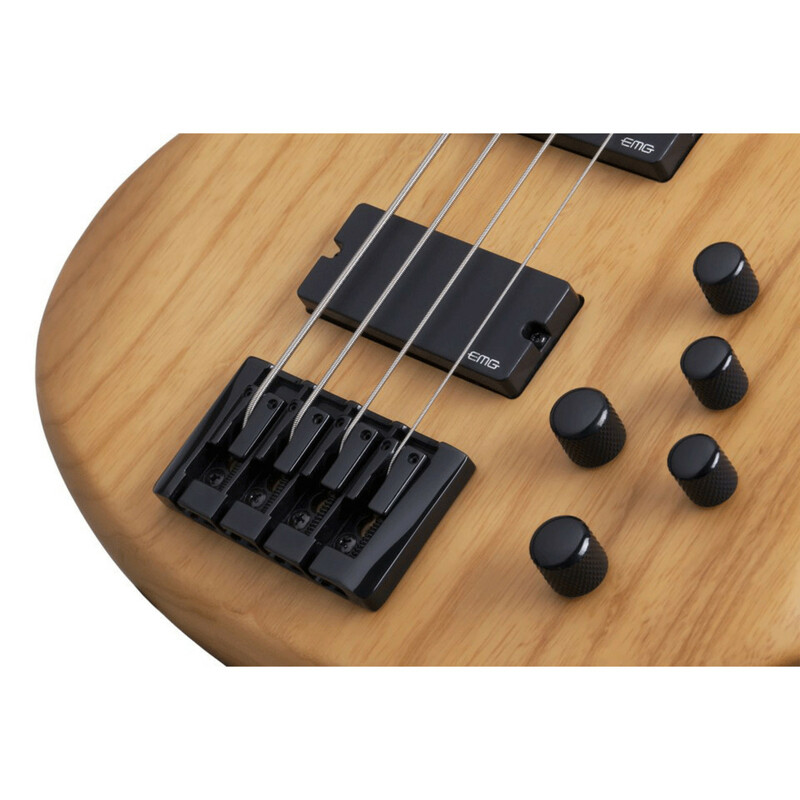 The bass also features Schetcer’s custom bass bridge, black hardware, and an aged natural satin finish that shows off the natural grain of the guitar woods. With a neck and fingerboard both constructed from maple, the Schecter’s tone is tight and cut, providing an edge of sizzle to the highs and firmness to the lows. 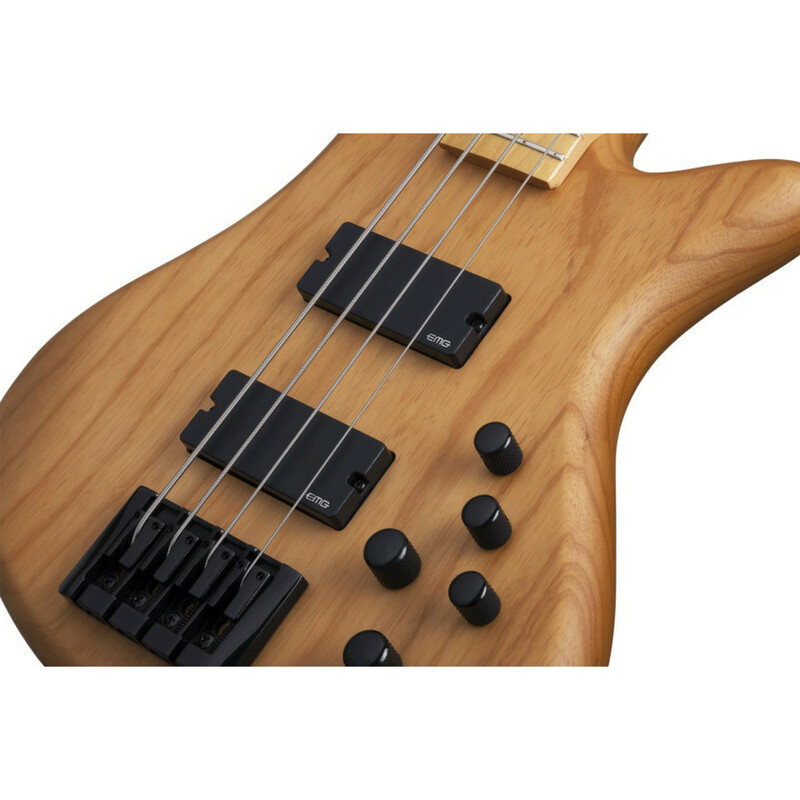 The maple wood provides bright characteristics to the overall tone, whilst offering a snappy attack in the midrange. When the strings are played hard, the wood produces more punch to the tone, and when played with light or medium picking, then tone has excellent clarity. The bass guitar also comes with many other features, including Grover tuners, a Graph Tech nut, and ebony side block inlays on the fretboard. The Schecter Stiletto Session-4 Bass Guitar features a set of powerful EMG pickups allowing it to produce sensationally punchy lows and crisp sharp highs. An ultra-responsive dual coil EMG 35DC is positioned at the bridge to provide a full and thick tone whilst keeping unwanted noise to a minimum. An EMG 35J single coil pickup is positioned at the neck to provide a warm, deep tone thanks to the increased low frequency response, allowing you to achieve a vast range of professional tones. 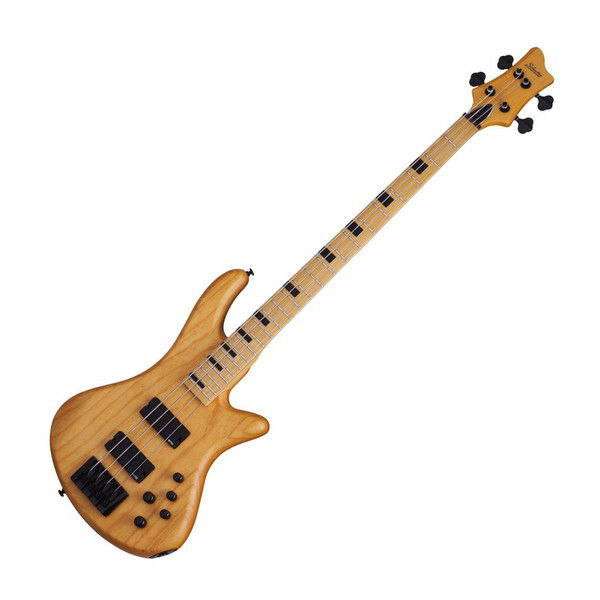 The Schecter also features a 3-band EQ with controls over the bass, mid and treble, allowing the bass to be shaped to best suit your playing style.